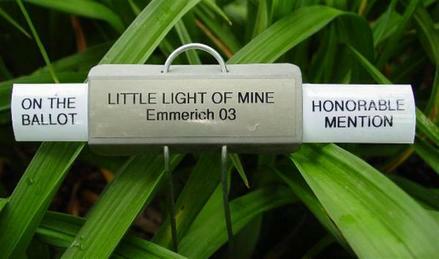 Labeling your garden for tours (or sales) Judy Davisson has given me permission to post this great idea. Thank You Judy for the idea and permission to share it with others. I'm using the EON nursery markers and discovered that the mini blinds that I have on hand all the time for marking seedlings work great for making "wings" to add information such as "on the ballot", "sold out", "future introduction", price information, or whatever you would like to add at the last minute. The blinds slide in behind the plate and are held in place with the wires that are already on the marker. are eligible for. This should make it really easy for garden judges that come for our regional tour. they are easy to change from year to year, or if you want to run a special or mark something as being "sold out".